BC needs a revitalized jobs plan. The provincial government’s narrow focus on Liquefied Natural Gas (LNG) hasn’t worked. The government hitched BC’s economic wagon to the elusive investment decisions of foreign transnational corporations, and to the ups and downs of international commodity prices, and the hoped-for investment simply didn’t materialize. And for all the talk about innovation, BC’s current economic strategy is rooted in old-style extraction and exporting of minimally-processed natural resources. We can do better. Instead, we need a jobs plan driven by us – where public investments leverage private investments in the sectors and communities that need them most. the affordability crises in housing and child care. What follows is an ambitious four-point plan that does just that. But first, here’s why we need a new approach. 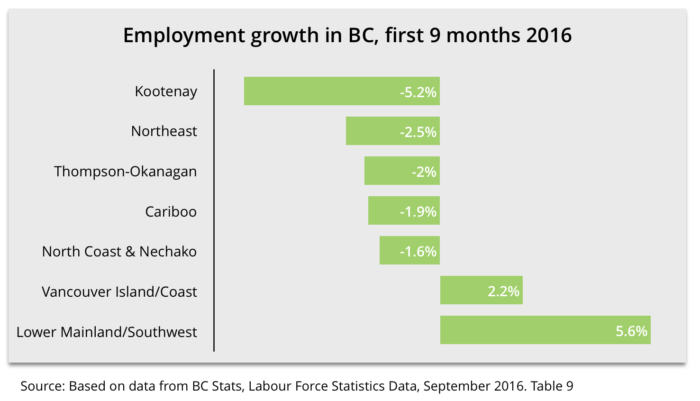 It seems the provincial government never misses an opportunity to boast about the strength of BC’s economy and employment. No matter the question, “jobs and the economy” are the answer. But in truth, the government’s own Budget forecasts weak economic growth over the next few years (better than other provinces, but low by historic standards). And the jobs picture is not much brighter. For six years after the major recession in 2008/09, the employment rate in BC flat-lined. Meaning, the share of working-age British Columbians with a job barely budged from the recession lows. Things finally picked up over the last year, but the working-age employment rate is still below pre-recession levels. And this says nothing about the quality of the jobs that have been created (a topic for a future post) – or where they’re located. And that’s where the picture gets really grim for most regions. Virtually all the recent job growth has been in the Lower Mainland, and to a lesser extent Southern Vancouver Island, driven by the housing boom. In contrast, there has been no job growth this year in the regions that were specifically promised jobs courtesy of the LNG pipe dream. This slow uneven job growth isn’t good enough. But here’s the good news: there is no shortage of practical ideas for building a robust jobs plan, with good jobs that reach every community in the province. And we can tackle some our most pressing social and environmental challenges while we’re at it. The CCPA published a paper last January with more than 50 job-creation ideas, available here, and more ideas here. But we’re focusing our efforts on what we see as four key planks to a progressive jobs agenda, along with proposals for how to finance them in a way that makes our tax system more fair and reduces income inequality. Climate adaptation infrastructure (such as sewer and dike upgrades). 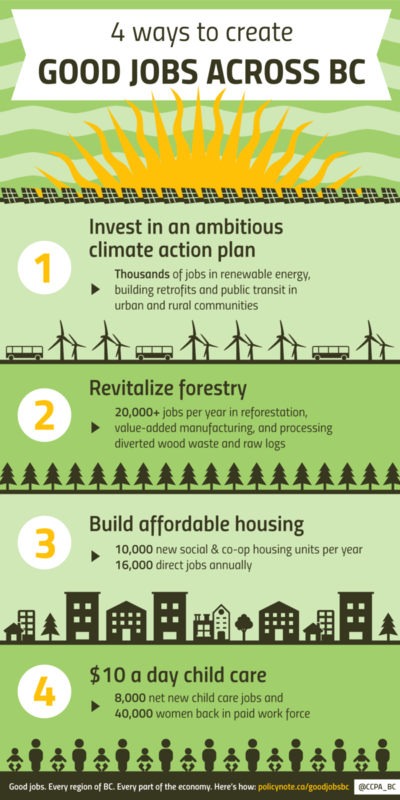 These ideas have been well developed in numerous reports from our Climate Justice Project, including reports on green jobs; zero-carbon affordable housing; transforming our transportation systems to dramatically lower greenhouse gas emissions; and how to meet our energy and electricity needs without fossil fuels. How to pay for these investments? To a large extent, they are capital expenditures that should be financed like traditional infrastructure projects (hospitals, schools, roads, etc.) through borrowing and repayment over the life of project. But a good chunk of the money needed should come from annual increases in BC’s carbon tax. CCPA economist Marc Lee has shown how we could use half the revenues from an escalating carbon tax for the climate investments noted above, while directing the other half of the revenues towards a re-structured credit for low- and middle-income households. The net impact would be to make the bottom half of BC households better off – getting more from the credit than they pay in the carbon tax. This shift would transform an unfair (or regressive) tax into a fair (progressive) tax. Instead of fixating on LNG and other non-renewable resources, the provincial government should focus on reviving BC’s long-neglected forestry sector. 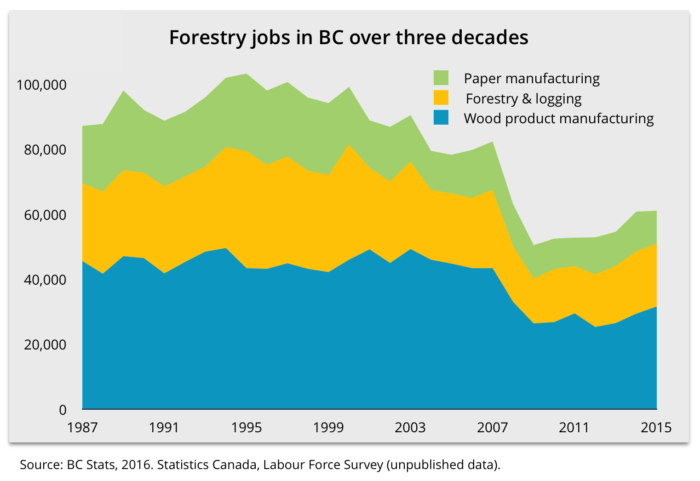 Forestry employment has been in decline since the late 1990s, but took a sharp fall in 2007. The blue area shows the decline in wood product manufacturing. We have literally been going down the value-chain, exporting more and more raw logs while capturing less and less of the value (and jobs) from this publicly-owned resource. All the while collecting minimal stumpage fees. As the CCPA’s Ben Parfitt recently reported, last year BC exported close to seven million cubic metres of raw logs – enough wood to frame 165,000 homes or roughly half of Vancouver’s detached housing stock. Forestry—a renewable non-fossil fuel resource—should have a bright future. Unlike the oil patch, which forces many workers to leave their families for three weeks a month, forestry jobs tend to be located closer to where people actually live, and in the communities wrestling with some of BC’s highest unemployment rates. As an added bonus, the capacity of wood to store carbon also makes forestry management a part of the climate solution. Managing BC’s forests so we conserve more, waste less and promote wood manufacturing would help lower CO2 in the atmosphere. That’s because healthy forests with long-living trees act as carbon sinks, and solid wood products store carbon over many decades. And if we were to substantially invest in reforestation, process wood waste, and implement policies that finally move us up the value chain (instead of shipping raw logs) forestry could be a key part of a sustainable jobs strategy. We estimate a carbon-focused jobs agenda in forestry could result in 15,000 more manufacturing jobs and another 5,000 seasonal tree-planting jobs per year. That’s far more jobs in more BC communities than we could ever expect from LNG. Housing construction and sales have been driving recent employment (primarily in the Lower Mainland). But we need to cool the market if we’re going to deal with the affordability crisis. So as we do so, we need to ensure jobs in this sector are sustained in a different and better way. Marc Lee, in his recent CCPA report on affordable housing, proposes a comprehensive plan to publicly fund the construction of 10,000 units of new social and coop housing every year. A build-out of this scale would create 16,250 direct jobs per year plus another 12,250 indirect jobs (based on current construction employment calculations). The cost of this large-scale building program would be approximately $2.5 billion a year. How to pay for that? As with the climate action investments mentioned above, much of this would be done through capital expenditures amortized over many years. Moreover, the construction and operating costs would be recouped over time in the rent collected from tenants. At the end of the day, investment in social housing leaves the provincial government with an income-generating asset. A large chunk of the funding, however, should come from a re-vamped property tax, where property tax rates are linked to the value of a home. Because here’s the thing – as bad as income inequality is, wealth inequality is much worse. And in BC, that’s driven by property ownership, and who won the lottery (home-owners in Vancouver and Victoria) versus who missed out (renters). Marc has shown how we could make property taxes more fair by shifting to a progressive system. BC’s Property Transfer Tax already works this way, applying a progressively higher rate to higher value properties. That’s great. But it’s unpredictable as a revenue source because it’s only collected when a property is sold, especially if the new foreign-buyer transfer tax does what it’s supposed to and cools the market. In contrast, progressive annual property taxes, with multiple tiers, could predictably raise another $1.7 billion a year. We should also overhaul the home-owners grant. It costs the treasury over $800 million a year and much of the funds go to wealthier people who don’t need it. Our public resources would be better used replacing the home-owners grant with a new housing credit that goes to all low- and middle-income people, both renters and owners alike. It’s long past time BC adopted the $10/day universal public child care plan, developed by the Coalition of Child Care Advocates of BC and the Early Childhood Educators. Universal child care in BC means sound early-childhood education and child development, and greater equality for women. The $10/day plan would also take pressure off young families struggling to afford housing and child care. Monthly child care fees for a family with an infant, for example, would fall by over $1,000 from $1,225 to about $220. According to research published last year by CCPA economist Iglika Ivanova, it would boost women’s labour force participation, resulting in 39,000 more women employed in BC’s paid labour force. It would result in the direct employment of many more child care workers – about 8,000 net new full-time positions in every corner of BC. And these estimates don’t include construction jobs building new child care spaces, or indirect jobs in related services such as supplies and food. Nor do they include about another 8,000 existing child care jobs where workers in the informal sector move into the public regulated child care sector. This shift would not increase the number of jobs, but these workers will see an improvement in their education, wages, benefits and job stability. How to pay for it? Fully implemented (which would take about 10 years), the $10/day plan would cost approximately $1.5 billion a year. Iglika’s research shows how to raise the needed revenues. In large part, the plan would pay for itself through higher employment rates for women, who in turn pay income and other taxes. The remaining funding gap can be covered by modest and staged personal income tax increases for the top 2 per cent of BC tax-filers, and a one percentage point increase in the corporate income tax rate (since businesses also benefit from a public child care program). The end result is a vital new public program, more jobs, affordability for young families, and more equality — paid for in a way that makes our tax system more fair. So there you have it. We can build a jobs plan that is hopeful and exciting, that reaches every corner of BC, and that makes a substantial difference to people’s lives. And we can pay for needed public investments in a way that reduces inequality and makes our tax system more fair—through a rising carbon tax and stronger carbon tax credit for low-and middle-income earners; progressive property taxes and a new income-tested housing credit; and modest upper-income and corporate tax increases.